Other Food: daily devos: What is truth? 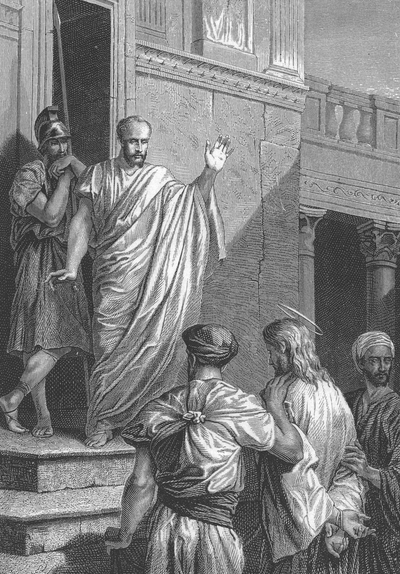 Pilate said to Him, 'What is truth?' " John 18:37-38. Jesus gave an odd answer to Pilate's question "'Are you a king then?'" We would expect Him to say that He was born to establish a power base and to conquer and rule over a land. Instead He says He was born and came "'...to bear witness to the truth.'" He appears to be saying, I came to be the king, not of earthly power, but of truth. Of course this description of His kingdom agrees with what He said to Pilate just a little earlier: "'My kingdom is not of this world … My kingdom is not from here'" - John 18: 36. His next sentence reveals more of His thinking along this line: "'Everyone who is of the truth hears My voice.'" It's like He's claiming to be some sort of Pied Piper of the Kingdom of truth. He explains, describes, talks, and lives truth. Some ("'...everyone who is of the truth...'") observe His life, hear and recognize His truth words. By that very act of hearing (and if their hearing is real, it will also involve actions like faith, acknowledging His claims, repentance etc.) they show themselves to be His subjects, the citizens of His kingdom. I think we can safely say that, at this point at least, Pilate is not one of them. His question: "'What is truth?'" still hangs in the air today. "Pre-modern era was one in which religion was the source of truth and reality. God’s existence and revelation were givens in the culture. In the modern era, science became the source for truth and reality. During this period, religion and morality were arbitrarily demoted to the subjective realm. In the present, postmodern era, there is no single defining source for truth and reality beyond the individual. Postmodernism simply radicalized relativism and individualism and then applied them to all spheres of knowledge — even science" - Steve Cornell, "What Does Postmodern Mean? ", emphasis added. However, across the years, even as the definition of truth has shifted from religion to science to self, Jesus' Kingdom of Truth claims continue to exert their magnetic pull. If we have heard His voice and become His disciples, we're part of that kingdom, no matter how our society currently defines truth. However, the acknowledgement of Jesus as truth puts us out of step with our culture—something that I'm sure is not news to you and me. PRAYER: Dear Jesus, Your claims of being truth challenge me to dig deeper into their meaning and discover more fully how they should work themselves out in my life.